Plastic Tamper Resistant Rat Poison Bait Station will hold rat poisons safely from access by children and pets. Rats eat poison bait more readily in dark, secure places which makes these boxes the best containers to use when baiting against rats. 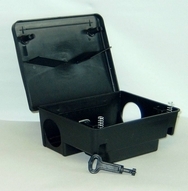 These Plastic Tamper Resistant Rat Poison Box Stations are for use indoors or outdoors and are weather proof to protect the rodent rat baits from all conditions.